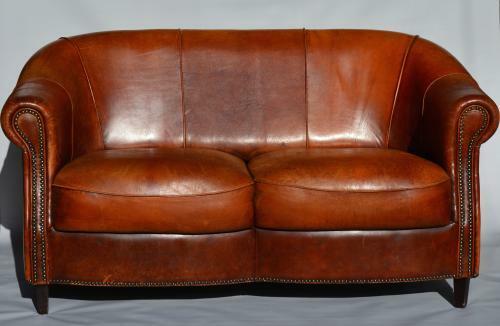 Superb original French 1930's brown leather sofa. It has very nice shape and colour. The leather is Sheepskin so is very soft to the touch and very comfortable. The leather is set off with the nice stud work. It is in very good condition for the age with minimal wear. This shape is a lot more rare then the normal club shape. This will look stunning in any interior and has the look that is in fashion at the moment. Recently sourced from France.